Titanium was discovered in 1791 by Reverend William Gregor, an English clergyman and mineralogist. Though he did write a paper describing his find, a black magnetic sand now known as ilmenite, and hypothesizing that it contained a new element, he was not confident in his discovery, which got little scientific attention. Several years later, Martin Heinrich Klaproth confirmed the presence of a new element in a similar magnetic mineral, and named it for the Titans of Greek mythology. Many failed attempts were made to isolate the pure element from such minerals before Lars Fredrik Nilson and Otto Pettersson finally succeeded in 1887. The vast majority of titanium ore is processed to titanium dioxide. This material is used in the production of other titanium materials, including ceramics, but most often is used directly in a vast range of products. With a very high index of refraction and optical dispersion, the bright white powder is an excellent white pigment and opacifier used widely in producing paints, paper, plastics, and ceramic glazes. It is additionally added as a strengthening filler in cements and graphite composites, and used in sunscreen due to its ability to absorb UV light. The material is also of interest for photocatalytic abilities; in the presence of sunlight, it produces hydroxyl radicals. This phenomenon is exploited in applications such as dye-sensitized solar cells, self-cleaning glass coatings, hydrolysis catalysis, and paints and cements that can reduce air pollution. Titanium metal is valued for use in a wide range of alloys because of its high strength to density ratio and high resistance to corrosion and fatigue. These alloys are used widely in aircraft, armor plating, naval ships, spacecraft, and missiles. Additionally, titanium is used in jewelry for its high durability and ability to be anodized to produce a wide variety of colors. The metal is also biocompatible, and is frequently used in medical implants and surgical tools, either alone or as part of metal-ceramic composites. Titanium is especially useful in dental and orthopedic implants, as it can integrate with bone. The other major commercial use of titanium is in ceramics. Titanium ceramics are typically extremely hard, and often exhibit useful electrical properties. They may be used in composite structural materials such as cermets or in extremely hard cutting tools for metal machining, or in technical applications such as electronics or medical implants. Barium titanate and lead zirconate titanate are important electroceramics found in ceramic capacitors, transductors, and sensors. Lithium titanate is an important conductive ceramic use in some lithium ion batteries and in molten carbonate fuel cells. Titanium nitride is notable for being both conductive and biocompatible, which allows its use in implants including bioelectronics, and as a barrier metal in the manufacture of microelectronics. Other notable titanium compounds include titanium disulfide, an inorganic material of interest for use in improved battery designs and nanostructured hydrogen storage solutions. Titanium occurs primarily as the minerals rutile and ilmenite, which are often found as components of heavy mineral sands. These minerals cannot be processed to titanium metal through high-temperature reduction with carbon, as is the case for some other metals. Instead, the pure metal is produced by first chlorinating titanium minerals, purifying the resultant titanium chloride via distillation, and then reducing the purified chemical using magnesium or sodium in an inert atmosphere. This complex processes largely accounts for high cost of titanium metal, but alternative, potentially cheaper processes are under development. Some titanium alloys can be made via direct reduction of titanium ores, and this allows their production without the expense of producing pure titanium. Additionally, most commercial titanium compounds acquired from mineral concentrates without passing through a metallic phase. The most commonly used titanium compound, titanium dioxide, is produced using either the sulfate process or the chloride process, depending on the source material and the purity required in the final product. In its metallic form, titanium is both strong, lightweight, and highly resistant to corrosion. Thus it can be found in numerous aerospace and military applications. Titanium dioxide is used to produce a white pigment. Titanium is the basis for numerous commercially essential compound groups, such as titanates for electronic and di-electric formulations and in crystal growth for ruby and sapphire lasers. Titanium is available as metal and compounds with purities from 99% to 99.999% (ACS grade to ultra-high purity). Elemental or metallic forms include pellets, rod, wire and granules for evaporation source material purposes. Titanium nanoparticles and nanopowders provide ultra-high surface area. Titanium oxides are available in powder and dense pellet form for such uses as optical coating and thin film applications. Oxides tend to be insoluble. Titanium fluorides are another insoluble form for uses in which oxygen is undesirable such as metallurgy, chemical and physical vapor deposition and in some optical coatings. Titanium is also available in soluble forms including chlorides, nitrates and acetates. These compounds can be manufactured as solutions at specified stoichiometries. Titanium is a Block D, Group 4, Period 4 element. The number of electrons in each of Titanium's shells is 2, 8, 10, 2 and its electron configuration is [Ar] 3d2 4s2. 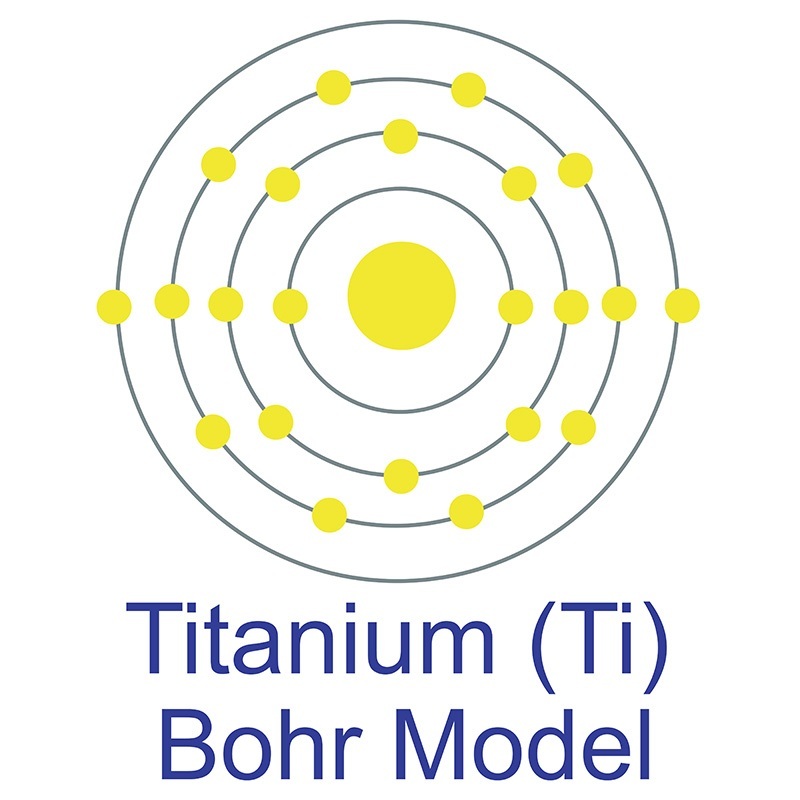 The titanium atom has a radius of 144.8.pm and its Van der Waals radius is 200.pm. In its elemental form, CAS 7440-32-6, titanium has a silvery grey-white appearance. Titanium's properties are chemically and physically similar to zirconium, both of which have the same number of valence electrons and are in the same group in the periodic table. Titanium has five naturally occurring isotopes: 46Ti through 50Ti, with 48Ti being the most abundant (73.8%). Titanium is found in igneous rocks and the sediments derived from them. Titanium was first discovered by William Gregor in 1791 and is named after the word Titanos which is Greek for Titans. Titanium metal is not considered to be toxic, although titanium in the form of metal shavings or powder is considered a fire hazard. Safety data for Titanium and its compounds can vary widely depending on the form. For potential hazard information, toxicity, and road, sea and air transportation limitations, such as DOT Hazard Class, DOT Number, EU Number, NFPA Health rating and RTECS Class, please see the specific material or compound referenced in the Products tab. The below information applies to elemental (metallic) Titanium. Titanium has five naturally occurring isotopes: 46Ti through 50Ti, with 48Ti being the most abundant (73.8%).